Today was pretty much given over to the funeral of James Martin, my father in-law. He was 89 years old. He served his country honorably in World War II. And he was a good provider for his family. A large number of family and friends attended to pay their respects. When I die, I would not like a funeral. Maybe I’ll donate my body to science. If they can find any usable parts, take them with my blessings. I’m sure I won’t need them. Instead of a funeral or a wake, my friends will have an agility trial and run some of the toughest courses I’ve ever designed. Then I can go on to my final rest with people cursing me and behaving pretty much as they did when I was alive. I’d like that. Those that don’t actually have dogs can be put to productive use… you know, leash running and fluffing the chute. Okay, I promised to write a new blog entry for 100 days in a row, repeating an exercise I did a few years ago. I want to cover some new ground… I’m especially interested in giving good documentation to the Back Pass, including some video to make my training points for me. There’s a book I’ve wanted to write for several years to cover the fundamentals of agility handling. The working title has been Agility Chi. I’ve actually written most of it already. The material needs to be gathered up, organized, and presented in a consistent voice. The thing about fundamentals is that fundamentals never change. Consequently the need for the exposition of the basic science of agility handling is, if anything, as relevant today as it has ever been. I’ll let you know how that project progresses. I have another project up and coming. We are going to endeavor to launch a Top Dog agility league in southern California in the February/March 2015 timeframe. I’m ever the optimist. This is a variation of the Tandem that I call the “New Jersey Left,” or the “Whiplash Turn.” Have you ever driven a car in New Jersey? In order to turn left you actually have to turn right three times. Sure, it gets the job done. The handler changes lead hands and goes on without mishap. The bad part of this movement is that it uses about three seconds without actually going anywhere. Sometimes the New Jersey left is done intentionally. Sometimes it’s done by accident. Refer to the same drawing, above. The handler picks up his counter-arm and points the wrong direction. Sometimes the handler will actually lean in the opposite direction of the turn, or take a little sidestep that way, before pushing into the turn. The only fix for this is to demonstrate how a person turns a corner. You move to the corner, and then you turn and go in the direction of the turn. What you don’t do is flap your arms, or lean away from the turn. The handler, in a Tandem Turn, should turn the corner the very same way he’s been turning corners his entire life. This illustration shows the handler stepping in front of the dog, intruding on the dog’s path, turning the dog more sharply than intended. This is not a Tandem Turn. The handler isn’t in position to do anything about it. The Tandem is a cross “behind” the dog. If there’s any question of anatomy, the “behind” is the bit with the tail, a difficult concept for those who own Aussies or Corgis. When teaching the dog the Tandem a handler who consistently steps in front of the dog rather than behind the dog may shut the dog down. Great care should be taken to avoid stepping in front of the dog. This might be saved first of all by showing a very aggressive rotation of the handler’s shoulders. In the illustration the handler is using an inside-arm Tandem. It might be better to use the counter-arm so that the turn goes hard and deep. The real problem here is the selection of movements. On the approach the handler probably should plan on a Back Cross rather than a Tandem. One of the attributes of a Back Cross is a tightened turn on the landing side of the jump. This is an instance in which a tightened turn might be desirable. The Tandem Turn is fast dog handing. The handler is mostly behind and pushing. The handler should practice with both the counter-arm signal and the inside-arm signal. Questions comments & impassioned speeches to Bud Houston Houston.Bud@gmail.com. The web store is up and running. www.dogagility.org/newstore. I have five volumes (over 100 pp each) of The Joker’s Notebook available on my web-store at an inexpensive price. These are lesson plans suitable for individual or group classes for teaching dog to work at a distance. I’m afraid that some of the directional training I’ve put directly on Facebook (Cedar has her own page: .) Consequently you can’t step back through my blog and put the pieces together nicely. I’ve resolved to make sure I publish each in the blog. I’m well pleased with her willingness to work and learn. The Right command developed nicely into a full turn on nothing but a verbal command (little or no physical help or support). Shortly after making the recording above, I introduced Cedar to a “Left” directional. Of course this made her brain explode because she’d pretty much decided that offering a Right turn was the magic. She might as well get used to the idea that there’ll be a lot of new magic. It feels a bit like I’ve skipped over the intro. Even in this recording Cedar has already figured out that if she just turns her head slightly to the left she’ll get my praise and a tasty treat reward. Making the intro requires a bit of patience. I believe in free-shaping. That means little more than waiting for a dog to offer a performance or behavior that I want to build on. So, after giving the “Left” command (in the intro)… I just wait for her to serendipitously look to the left. And when she does, I’ll praise and reward. After a bit she’ll be able to focus on what thing she has to do to earn the reward. It’s really quite as simple as that. The next step will be to get her to make a full turn when I give a “Left” command. Initially I may lure at this step to enhance the performance that she’s already offering. Then gradually I will minimize and make smaller the physical cues until there is nothing left but the verbal. 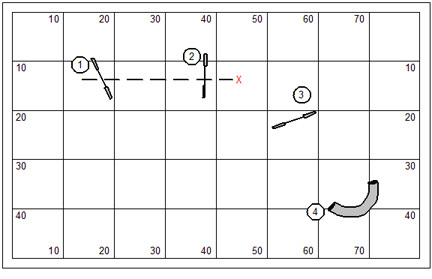 Next week, hopefully, I’ll publish an update on the Left directional training. I had to take the week 17 measurement a couple days early. I’m going to be judging a USDAA trial in Milwaukee this weekend and I’ll be on the road on her official measuring day. 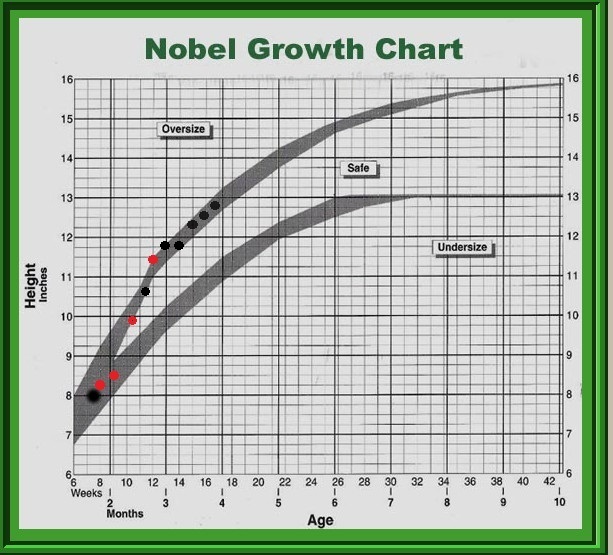 At any rate, I’m impressed that Cedar is growing like a Sheltie, the breed that the Nobel was intended to chart. Our measurements fit neatly on the top of the curve. So if her growth remains true, she should come in right at about 16″, which is top of the standard for a Shetland Sheepdog. In case you missed the story, Cedar’s dam is a feral sheltie. A dog rescue angel over in West Virginia manages to scoop up the dam’s occasional litters, though the dog herself has managed to escape capture. We have no idea what is the sire. I’m thinking it must be something like a Rat Terrier. She does have a hard-headed “what’s in it for me” kind of mind-set, which is consistent with the nature of a terrier. Cedar is now 4 months old, and weighs roughly 10 pounds. This week we’ve introduced Cedar to the pipe tunnel. It’s kind of fun to have 16″ diameter teacup tunnels. They’re lightweight and so very portable. They are also of an appropriate size for a young puppy! The leash manager will see to it that if the dog tries to go right or left around the entry to the tunnel, she’ll come to the end of her leash. If she volunteers to go through the tunnel, then the leash will slip through the trainer’s hand, rewarding the dog for her choice. Over time, you add length to the tunnel, and gradually bend it, to the extent that the dog cannot see the exit from the entry. This is a simple methodology and subscribes to a training philosophy that as much as possible the dog should choose every footstep. We don’t push or pull the dog through any performance. If there is a down-side to this introduction to the tunnel it is that the handler is considerably embedded in the context of the presentation. So our next step is to emphasize the verb or command for the performance of the tunnel, and begin working at greater and greater distance so that she has to go away to offer the performance without her handler hovering over, or flapping arms. Cedar appears to be following the growth pattern of a Sheltie and should come in very neatly just under 16″. Whether she remains true to the predictable growth pattern of a Shetland Sheepdog remains to be seen. We don’t know what kind of beast was her sire, after all. At 7 weeks Cedar weighed 3-1/3 lbs. She was weighed yesterday at the vet’s office at 10 lbs. Clearly, she’s getting enough to eat. Posted in Cedar Shakes the Woof, Obstacle Training | Comments Off on Cedar Shakes the Woof! Okay, it’s about a bazillion degrees outside; and I spent the morning yesterday setting up this course on the grassy out-of-doors agility field. I don’t actually have minions to help me, so you can imagine the buckets of sweat that soaked my clothes. Marsha isn’t a big fan of out-of-doors play. For me playing on grass is fundamental. It’s how agility was meant to be played. I’m sympathetic to Marsha, and everybody who prefers to play in the shade and away from the bugs. Weather is cruel more often than not in Ohio. Either it’s freezing and icy; or it’s muddy and wet; or it’s brutally hot. There might be a dozen days out of the year on which conditions are perfect for both human and canine. I’m very aware of the safety issues when working a dog out in the sun. With our dogs, I’ll only work outside for ten or twenty minutes when temperatures are so high. This course, by the way, is both the oldest and the latest course challenge for Top Dog Agility. We’ve had a subtle rules change that allows re-running of any course. What it really means is that a course or game never “closes” but is left open like the high scores on a video game at the arcade where everybody has a shot at getting to Top Dog. I’m having a conversation with a club down in Valencia, Argentina about joining us in the play of this course. That should be fun! Hey… isn’t it Winter in Argentina? I have a class coming this evening. The out-of-doors course will be our league play course. But class needs to be in the building (in the shade). I don’t have air conditioning in the building. The best we can do is run the big fans on people and dogs. Since I dragged all of our big equipment down onto the field, that means I had to come up with a set of the floor for lesson planning purposes. Small Universe comes to the rescue! This is a product that I created (several years ago now)… which is a .pdf with a wide variety of sequences that are arranged by different dimensions. All I have to do is scan through them, find one I like, and then click on the picture to spawn it into Clean Run Course Designer. Then, of course, I can modify it for my immediate needs. Small Universe has been a life saver for me many times over. I shared in my last blog a new contact training protocol for the 2o2o position. Marsha immediately put it to use for her crazy redhead BC Phoenix, and it has been transformative and amazing, IMHO. And so I wanted in this lesson plan to provide a foil for testing and practicing the method. What’s substantially different in Marsha’s work with Phoenix and this lesson plan… is that Phoenix gets to do his thing in the presence of other dogs and people. That heightens the crazy redhead gene, to be sure. I’ve reversed the flow so that we get to work in both directions. Naturally I have about six or eight sequences that are based on either set of the bi-directional equipment. You should know that our full-size teeter is on the lower field. I’ll actually be using one of teacup teeters (8‘ ramps) in class. For like the next three weekends I’ll be out on the road doing judges clinics for the TDAA. I’ll be traveling with Hazard and Haymitch and will have an opportunity to run both of them in the TDAA trials that are part of the TDAA clinic experience. It’s actually problematic whether I’ll be able to run them at all, because I’ll be very busy in the conduct of these clinics. Of course, I copied all of this right off the TDAA Events Calendar. I’d like to share with you a YouTube of my Jumpers run with Kory this past Sunday at Queen City. It was a fun course, quite suited to us (Kory and me); and everything went as scripted. I even got to do a Back Pass to manage Kory’s transition to the weave poles. This was the bright spot of the weekend. I had two runs with “one little thing” to glitch the run. And I had two runs that were complete train wrecks. I humbly accept this difficulty. I think I’ve reported to you that I don’t move well (not like I used to move). And so I try to do most everything at quite a distance. As I’ve said for many years, distance handling is like throwing cards into a hat on a windy day. So when you get a card into the hat as I did in the Jumpers run… you can be happy. And when you don’t… oh well. One of our judges this past weekend put up an interesting challenge that I’m taking back to my training barn. Two jumps are set for a 180 turn… with the jumps set side-by-side, the wings touching. I’m a bit fascinated by this side-by-side jump challenge. As a course designer I know that the jumps are too close together to support the turning radius of any dog that works with the teeniest bit of inertia. But then, as handler and dog trainer I know that the tightened turning radius can be pre-cued to the dog. Certainly an argument can be made for the handling on the landing side of jump #3. However I’d like to solve on the approach because I am fond of any opportunity to throw cards into a hat on a windy day. On Saturday night… and I mean about 2:00 am in the morning something crept into my brain that I got me out of bed to work a bit at my computer to document. I had an epiphany about contact performance that I immediately knew in my heart is exactly the kind of thing I need to do with Kory. It works like this… the contact obstacle is the starting point and, mind you, a resting point. Before I embark on the sequence I’ll put him over the contact and he will come to rest at the bottom in a nice 2o2o position, until released. I know this doesn’t seem extraordinary at first disclosure. What I’m really trying to do is treat the dismount of the contact obstacle like a stay at the start line or on the table. As a basic rule of performance I’ll expect my dog to hold position until I give a verbal release. And frankly I don’t care if I’m standing still having a conversation or running in some random direction… my expectation is that he will stay. Dogs are creatures of rules. The performance you get out of them in agility (and in life) are based on the rules that you set for them. In a broad general sense this is precisely true. And so now, in my training, I will embark on establishing this new rule which is simply a fortification of the softer (though identical sounding rule) under which we previously operated. This is the bit that I leapt out of bed to sketch, when I had the epiphany. I could have numbered a lot of interesting things after either or both of the contacts; and I did, in fact. But then I deleted all the numbering but those that identified the contacts as the starting point… just to remind myself of the core concept. You’ll note that in the first sequence I drew (above) I managed to insinuate the teeter as the starting obstacle. Ted Cruz is a liar and a scumbag. Clearly he is a magnet for stupid people. I’m closely watching his campaign to abolish the IRS, mostly because I’m curious about how frigging many really really stupid people there are in this country (people who don’t read or keep up with current events and base there thinking on the raw propaganda and hate mongering of Fox Noose). I know there’s a whole bunch of them. 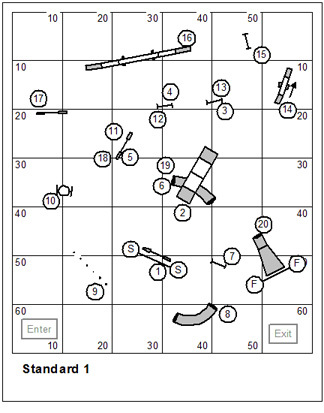 I think more and more about “control position” on the agility course. That’s that moment that requires the handler’s presence to solve. My training objectives are to limit the number of “control positions” by training to a conditioned response to verbal commands. But let’s face it, there’s stuff you just aren’t going to talk (or train) your way out of. Here’s a bit I find interesting. 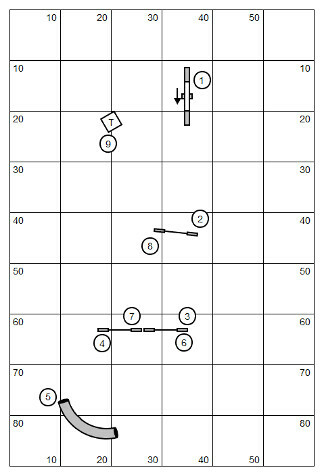 The challenging part is the transition from jump #3 to jump #5. Mind you, the handler coming off the A-frame might solve this with amazing simplicity and grace and with uncomplicated handling choices. I’m tempted to set it up and just run some different handling options to see how it goes. Note first of all that the dog coming off the A-frame might easily fix on the dummy pipe tunnel straight ahead. 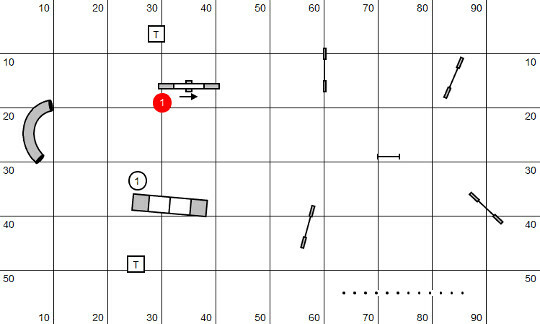 If this has no other consequence, it might draw the dog wider in the turn to jump #3 than the handler wanted – then presenting the #6 jump as a wrong course option… when it should not have been. After jump #3 is a tight little turn back to jump #4. 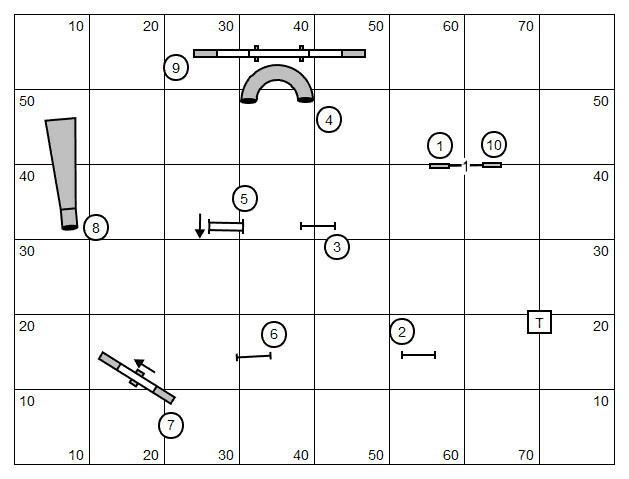 If the handler doesn’t manage this well the dog’s path might turn too wide between the two jumps, making the turn to jump #6 acute and uncomfortable. My solution to this requires a lateral distance during my dog’s performance of the A-frame and a 2o2o with a verbal release. As he comes a stride or two off the A-frame I’ll start a counter-rotation (Front Cross) but leave it incomplete so that I am facing back-wards when presenting the #3 jump. 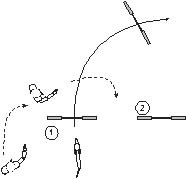 As he goes over the jump, I study his turn over my left shoulder, and as I feel his nose come around roughly towards jump #3, I finish the movement with a Blind Cross and push to the #4 jump. I’ve just described what I’ve called a Flip for the longest time… and the world pretty much calls a Ketchker these days. And oh, by the way, I’ll have to Rear Cross jump #4 giving a verbal directive to my dog to turn Right. We’ve published two new courses for Top Dog League Play beginning in July and we’re about to make some interesting revisions to the rules of play. Go here to look at our new courses: http://wp.me/p2Pu8l-20. I find myself in a convoluted trap of Social Media. I have my personal Facebook page; I have a Facebook page for the TDAA; and I’ll be darned if I don’t feel compelled to create a Facebook page for Top Dog. I’m also loosely in Linked-In, Google+, YouTube, and Spotify. Add to that the notion that I have moderator privileges on something like six Yahoo groups. And I have writing responsibilities on no fewer than three blogs. Look guys, I’m about a 60 year old man. And all of this stuff is just northwest of crazy. My niece Angi has me started on something called Hootsuite, an online utility from which I can monitor and contribute to all of these various tools. I don’t know if it’s really going to simplify my life. OTOH if I can see the whole crazy map at once it might at least succor me with the illusion of control. I’ll let you know how that goes. On the TDAA blog I’ve written a “Quidditch Design Tutorial” (http://wp.me/p18bml-iu). I’ve finally moved the Course Design College away from my regular blog to reside under the TDAA banner. I should have done so a long time ago. On The Top Dog blog I’ve posted new Events (http://wp.me/p2Pu8l-y). I’m playing with a new format to enhance interest in the courses. I’ve been following the news of the schoolhouse shooting in Newtown, Connecticut. 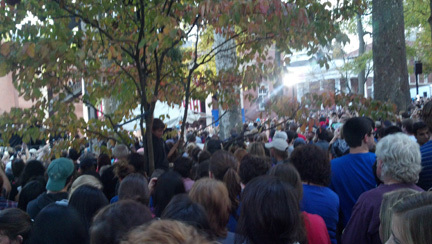 I’m horrified by the monstrous nature of this event. It is clear that there is a terrible sickness in the United States which is exacerbated and even made possible by the proliferation of guns in our society. This is precisely the time for a strong response from our government. We need strong laws. Hunters should have guns; and criminals and the mentally instable should not. Hunting weapons should be narrowly defined; and everything outside of that definition should be illegal. 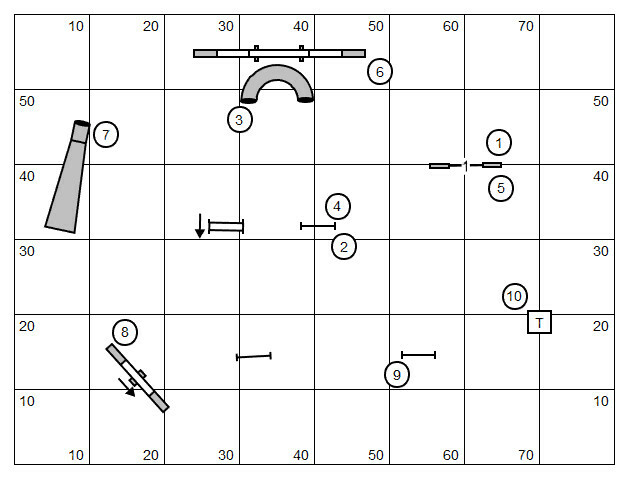 In course design for dog agility I would make an argument for speed-building flow in which the handler can release the dog to work. Each riddle of the course deserves subtle presentation so that the dog is working at a breath-taking romp. Even at full speed, or I should say especially at full speed, the riddle might testify to the analytical skill of the handler as much as the physical prowess of the team. 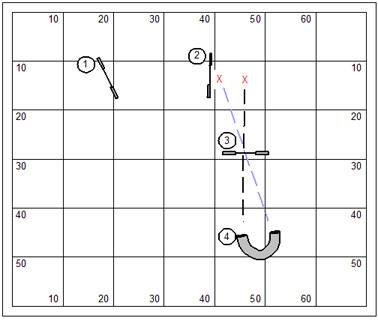 I’ve left on this short sequence the sleepy-dreamy lines of the Clean Run Course Designer. Taken as a picture this is just about as simple a sequence as you can imagine. What the drawing lacks is a true understanding of the dog’s path. I’ll try to explain. When analyzing the dog’s path I think in linear terms. I like straight lines, and sharp corners. So in this illustration I’ve added an “X” at the terminal of the opening line to demonstrate where the corner of the turn might be. Please note that this “corner” is variable in nature. The corner may shorten the opening line, or lengthen it based on variables like the speed of the dog, the length of his stride, and the cues of the handler. 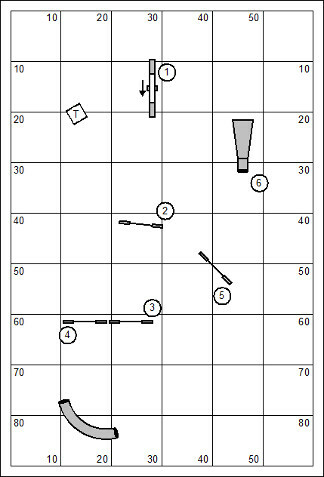 What is most important to understand is that the “corner” dictates the approach to the next jump. And the dismount on the next jump is dictated by that approach. 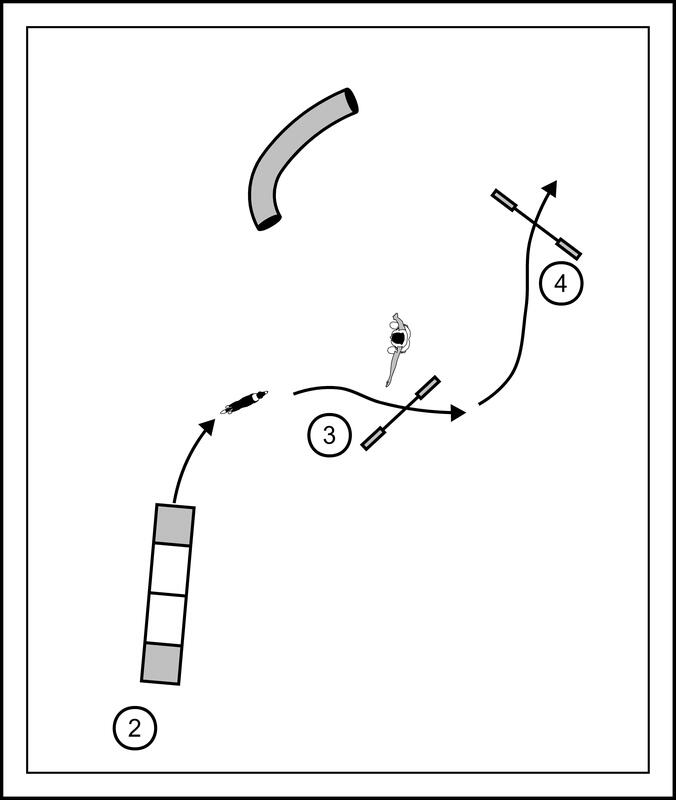 The first corner dictates the approach to jump #3 in this sequence. 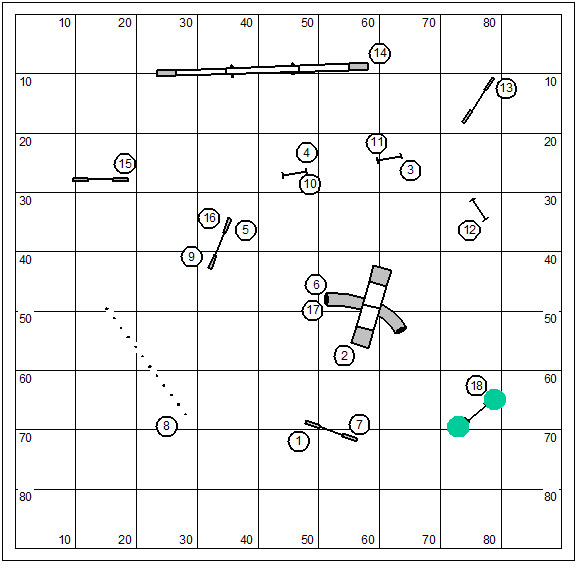 I’ve put another “X” to represent yet another “corner” after jump #3. 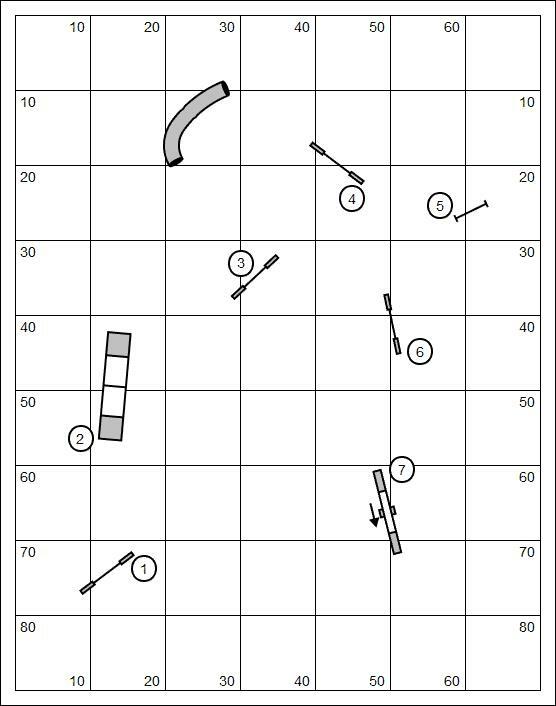 I’ve also continued the line to show the wrong-course presentation of the pipe tunnel if the handler doesn’t communicate that change of directions to the dog. I could launch into a pithy lecture of the one true way to handle this counter-side tunnel discrimination. In my heart I believe that whatever works is right. The handler could do a Front Cross, or pre-cue the turn, or vee-set the approach, Post & Tandem, or Flip the turn (Front Cross+Blind Cross+Tandem/Flick). 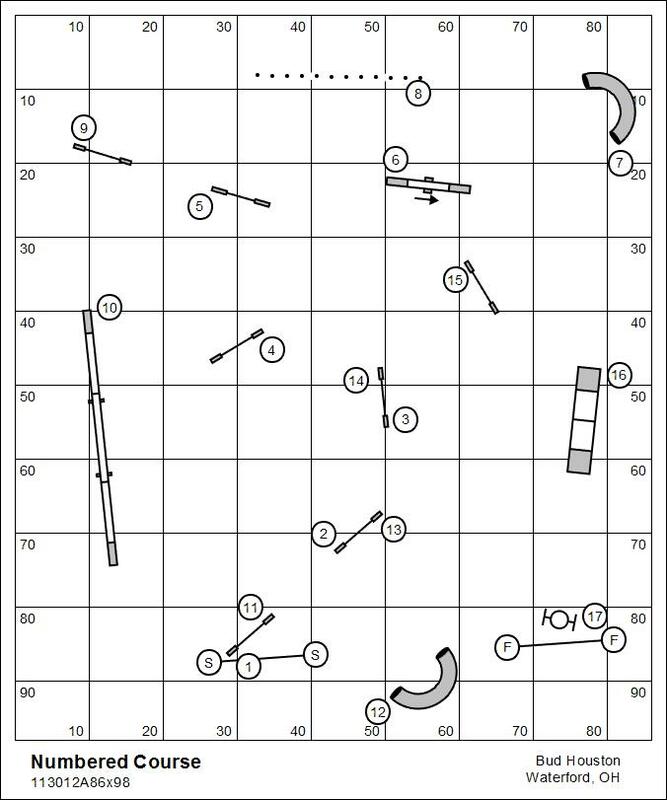 Frankly, as far as that goes, a big wide sloppy turn after jump #2 would bring the dog neatly to the correct entry to the tunnel. The handler needs to see this picture of the dog’s path. Knowing that there is a turn after jump #3 is important. I guarantee that just about everyone who loses their dog into the wrong end of the tunnel will be surprised that it was logically presented to the dog. Before I leave this discussion I must return to my comment above about the variability of the “corner” of a turn. You must know that the corner turned by a Doberman will be very different from the corner turned by a Yorkie. It is clear that the turning radius of the turn might contribute to both a different presentation and a different outcome on course. And for the handler who has taught the dog a tight wrapping pre-cued turn the calculation of the corner will influence the dog’s consequential path. I’ve been on quite a pace these days. A couple weekends ago I was in Temecula, CA for a TDAA club building event. This seminar/trial format was hosted by Jump’n Canines, run by Cindy Valdez. The site is beautiful, on a high vantage overlooking a nearly tropical desert. This early morning photo I took (from the side of the agility field) doesn’t really do much justice. You can just make out a half-dozen or so hot air balloons coming up in the cool morning air (center left) in the valley below. 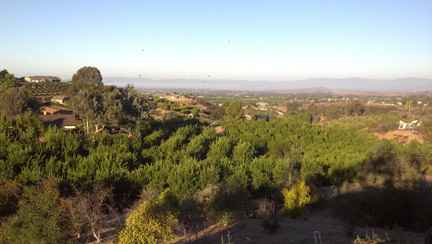 Temecula is about equidistant between San Diego and Los Angeles. I made the mistake of booking my flight through LAX. That means I got to re-experience insanely crowded Los Angeles commuter traffic. Anyhow, I got home fine… but only got to sleep in my bed for two more nights…then it was off to Grand Junction, CO for a three day handling seminar. This was a cool seminar as I had more auditors than working spots. It was a nice big group of friendly people, lovely to work with; and I’m just so sorry I don’t have pictures to share. I was at K9 PowerSports run by Geoff Teare. You can find them on the web at: www.k9powersports.com. Anyhow, the sound system was good and his speech was inspiring. I think I could have watched it on television though. I got a good view of that, anyhow. I’ve been away from my blog for some time. To tell you the truth even when I’m on the road I have to continue working on business. I spent my days in airports and on airplanes reviewing courses for the TDAA, for example. Returning home I note my chores have been neglected. I’m earnestly hoping I have a work/study camp coming up soon. But I’m too tired to look at my calendar. 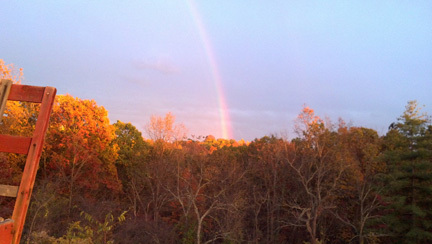 The rainbow was more spectacular in person I think. I’m heading out in the morning for a TDAA Club Building event in Temecula, California. Temecula is somewhere between Los Angeles and San Diego. I don’t know much more than that. The Club Building event is an interesting format. It is both seminar and trial. That is, in the context of the seminar all of the games we play and courses we run will be genuine qualifying opportunities. I’m looking forward to making new inroads into California where the sun shines all year long; and there’s lots of small dog agility enthusiasts. We’re always in an uphill battle getting the TDAA established in a new area. There is a lot of uninformed prejudice about what the TDAA is. The truth of the matter is that the TDAA is the toughest agility venue in the States. Think about it. Our courses are appropriately technical, by level, and there’s only about 8′ to 12′ between obstacles. Aside from the standard, numbered courses, the TDAA is a game players’ venue. Part of my objective on the weekend will be to make an introduction to a number of our games. I think everyone will have a blast. Anyhow, I’ll let you know how it goes. Hey John, you know that course we were working on together… for the Petit Prix? I’m so sorry but I’ve now published it in my blog. So we need to move on to something else. I just couldn’t resist setting it up in the building to play with (I won’t be running a dog at the Petit Prix). It was a lot of fun. Great course. The feature is the concave serpentine, taken twice. 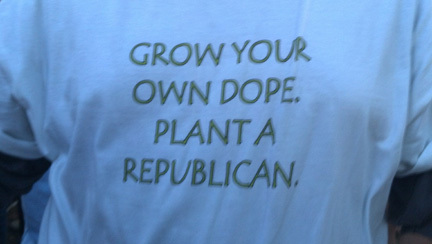 But it was really too small for my boy Kory. So I went down on the lower field and set it up, with some tweaking. This is the course I’ve been using all week to work on our contact protocol. The idea of a championship tournament in the dog agility world is to showcase great performances and to honor those dogs that play at the top of the game. Every venue has its own formula for this endeavor. In the TDAA our championship tournament, the Petit Prix, seeks a balance between speed and accuracy, skill in sequencing, distance work, and strategy; and without giving inordinate weight to any of these individually. And so the format is this, all dogs compete against all other dogs earning a ranking within the field. Consequently dogs will continue to earn points for placement that accumulate to the very last game that we play. At the end of the day, when the dust settles, the dogs with the highest accumulation of points will place at the top of the field. There is a calculation to appropriately compare the performance of our smallest dogs, to the performance larger dogs. Rankings within the field are handicapped. Placements will be accorded by jump height. At the Petit Prix a dog can earn a qualifying score that goes towards our titling programs. Of course, the qualifying score is earned at the dog’s respective level. That being said, all games will be scored using Superior rules for performance and faults. The idea of qualifying can be an unnecessary distraction in Petit Prix competition. The very worst thing a handler can do is abandon a game in abject resignation because the dog has committed some fault that leads to a non-qualifying score. The competitor should get it into his head that he’d much rather his dog earns the background ranking points of dogs in the 70 to 80 percentile than in the zero to 10 percentile. Melting down in competition is little more than surrender. If you fall down, pick yourself up and make a respectable finish. We’re working with the Host clubs to prepare a catalog that will have all of the courses, games and briefings of the Petit Prix. As much as possible the briefings will be concise and clear enough that every competitor can grasp the play of the games and map out the strategy for each of your dogs before you walk into the ring for briefing. If you have questions about how to play a game that is pertinent to your strategy be sure to ask those questions in briefing. As a courtesy to other exhibitors ask your questions while the judge has everyone’s attention… rather than asking the judge that question offline, so that nobody else gets the benefit of his answer. Warm your dog up before you go into the ring. Remember that “warming up your dog” refers to his mind as much as his body. For each regional Petit Prix we’ve scheduled four workshops over two days, working game-by-game through the classes of the Petit Prix, discussing handling and strategy choices. We’ve made one important change to the format of these workshops. We’ve decided to use the Warm-Up Workshops to test our new tournament software; and since we’re doing all that work… the warm-up games we’ll be playing will eligible for qualifying scores and will go into the record-book. Otherwise, there’s no change in price or in the format. I believe we might have a spot or two still open. But I won’t guarantee that. Get Paid for Reading My BLOG! How to Print Single Posts from the Web Log!